Ben has kindly contributed this article for publication. Over the last few years I had slowly got back into model rail-roading after remembering playing with one when I was a small kid. However over the last seven months I dedicated time and resources into getting Scene One of Four of my 21ft by 24ft “Coal to Synthetic-Oil Refinery (circa post 1990)” fully built and operational by the New Zealand Summer time (while working and studying at the University of Auckland). First of all, some background information on the layout. * Special Note: The layout is divided into four scenes with each scene then broken down into either 18″x36″ or 36″x36″ foam modules. The modules are designed to allow easy movement of the layout (I hope to exhibit the layout one day) as well easy building, operation and expansion as time and money allows. Each scene can be operated independently as well as together. The first part of the layout under construction is Scene One – the ‘Synthetic Oil Refinery’ and ‘Main Engine Terminal with completion due by Christmas. As a beginner to this, the entire experience has been one heck of a learning curve, but never the less a fun experience as I apply what I learn from each previous module built to the following modules being built. 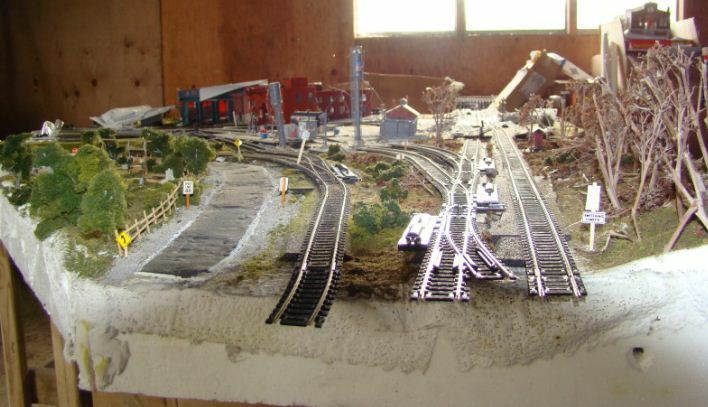 Yes I have consulted books, internet sites and forums as I began building my layout, but at the end of the day and as some advice – use your gut instinct and prepare to make continuous changes as you build the layout! As even when you have a plan drawn up (as I did) you will be making changes as you see what was on paper (or PC) become reality. This picture shows looking down the a set of Departure/Arrive Tracks looking “North” to what will be the main line (to Scene 2 and beyond). To the left you can see the turnouts leading to the main engine terminal and turntable where the locomotives after their runs are serviced, “turned” and sent back to the freight yard (south or bottom of the picture) for the next run. You can see a park next to the road on you left as well as a sort of out of place track. That track is planned to allow supply wagons to reach the terminal as well as an Out of Use depot (yet to be built). I would like to mention here a special thanks to my father-in-law (Reinhart) for helping me build the table stands for which the modules sit on. His help allowed not only allow me to continue with further expansions but save time and money bringing in a carpenter to do the work for me. 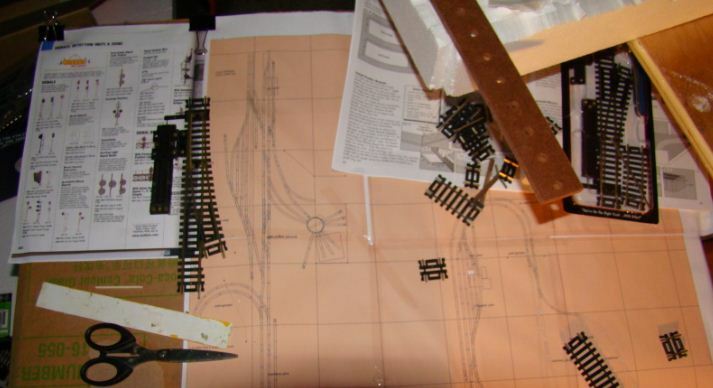 This next picture shows the current plan of my layout. Apologies for the quality. On the left of the plans is Scene One which I am currently building, with Scene Two (The Bridge Duplication and Mainline Industries) down at the bottom of the shot. Scene Three (The Coal Mine) can be seen at the centre of the plan with Scene Four (The Staging Yard Loop) located underneath that 1/3 18″ radius track. This final picture shows the current modules being built. 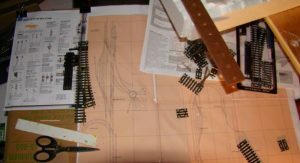 As I mentioned earlier the layout (except the stands) is built of foam with the track and structures later placed on top. This scene shows what will be the Coal to Synthetic-Oil Refinery (right) and the tracks that service it. The actual freight classification yard will be built ‘North’ (to the top) of the current modules. On the left of the construction is a 2-stall Engine House designed to be a R.I.P (Repair In Place) facility for wagons needing light repairs. 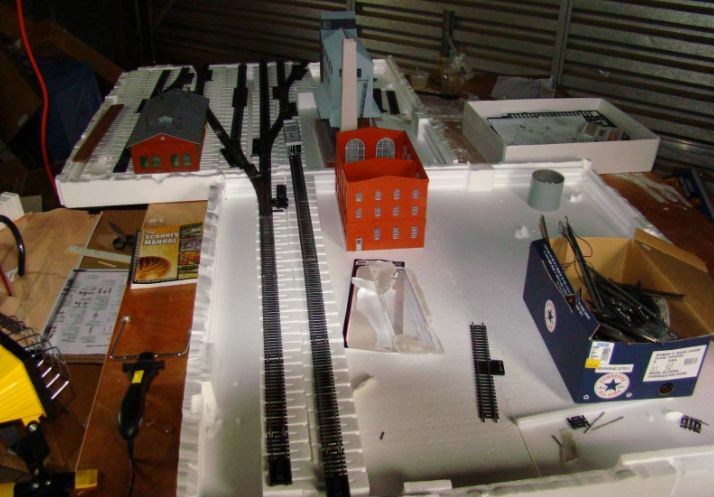 I’ll continue to post updates of my layout as more happens (I have nearly finished the refinery and will be soon wiring (another learning curve). For more details on my layout visit my blog http://bens-hotrainset.blogspot.com/ and see as I approach my first operating session this Summer.